A few of my Tolkienite friends have been convincing me to do a Tolkien inspired piece for a while now. So, inspired by their different suggestions, I decided to paint a scene similar in appearance to Beleriand (one of the many lands in Middle Earth during the First Age). In the end, I chose Brethil for the name because I found it to be the most fitting for a birch forest scene. Brethil is a birch forest after all! Being my first time working with oils, I am extremely pleased with how it turned out! Despite not being used to oils (as I have only worked with acrylics before), using them was a fun learning experience and I'm looking forward to working with oils again! I used a birch forest stock image to get a general feel for the look and atmosphere of the forest. 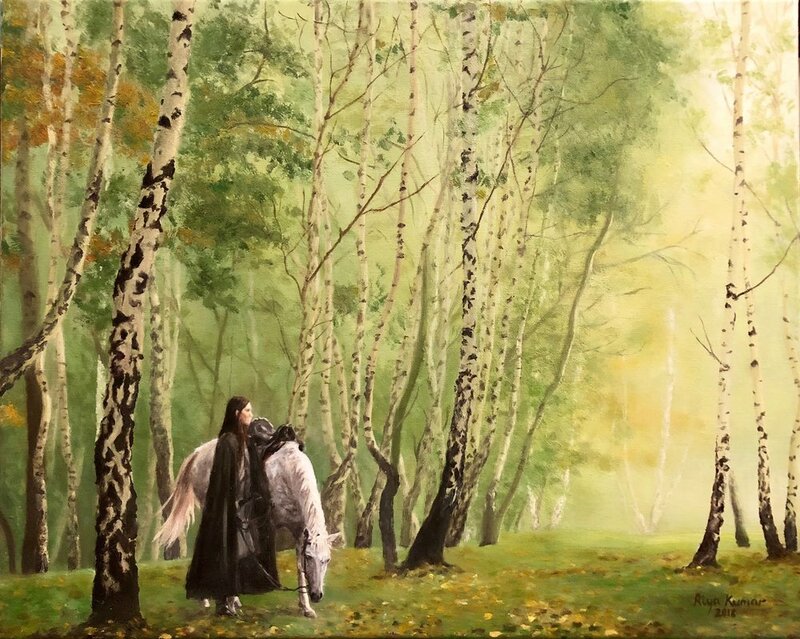 For the horse and the Noldo (a term used to refer to elves of the Noldor clan), I referred to cosplay by Filat (a Tolkienite artist who I greatly admire for their skills with watercolors). One of the same friends who gave me the inspiration for this painting also helped with the naming it "A Misty Autumnal Morning in Brethil" as well.